It was an unreal day. My friend and I decided to hike a trail in my town that I actually did not know. It was the trail where all the tweakers hung out so obviously it was a place I was unfamiliar with. We had been on our way to the creek near our homes, not the good creek thirty minutes away but the creek with the very low water levels and the tattooed and pierced youths of our one horse town hang out on the weekend. The water levels looked even lower and more stagnant than usual and the teenagers were looking more pierced and surly than we felt like dealing with so as it began to sprinkle just slightly and we were thinking of taking our hike some where else. 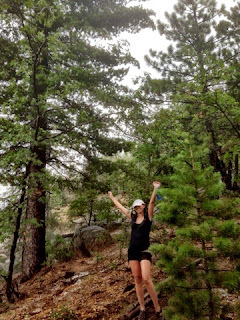 As we made our way down the path through wild ferns and currants and climbed between massive boulders the crowds of teenagers were doubling by the second and we thought it might be a better idea to go check out the newly built Coyote Rock Trail instead. It was beginning to sprinkle at this point and it was getting less humid and hot and more overcast. We drove the mile to the start of the Coyote Rock Trail, in the back of the ball field of my old elementary school. It was actually raining a little now as we left her SUV and started up the steep trail into the pine filled forest. 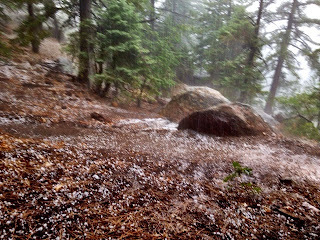 We were hiking fast uphill as it was raining harder now and I was getting cold. The thunder started rumbling to the East and I was beginning to think this might not have been the best idea as I shivered in yoga shorts and t-shirt. Lessandra’s blond and red hair is gorgeous and curly as usual but soaking wet. We both kind of have that wet drowned dog look about ourselves. 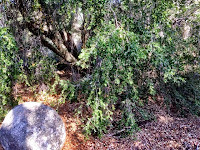 We are trying to survive an intense summer thunder storm, huddled under a scrub oak tree and its doing very little to protect us from dime size hail. 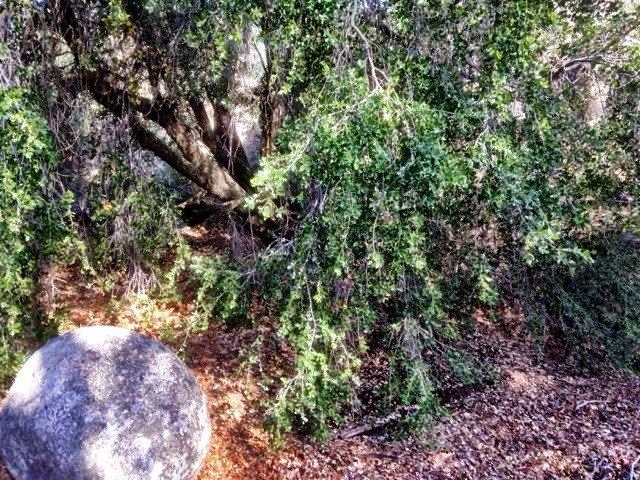 It just was not letting up at all and the puny scrub oak was doing nothing to protect us at this point. We made the joint decision to try and head back to the car even though the thunder was rumbling like mad and the hail and rain was pouring down. I felt bad for my friend who had been working to build this trail for months with other local residents and we were watching now as rivers ran down the trail, eroding the nice trail and just turning it into swampy puddles. It was these icy swampy puddles we were running through as we tried to make our way the mile back to the car but it was just way to painful. 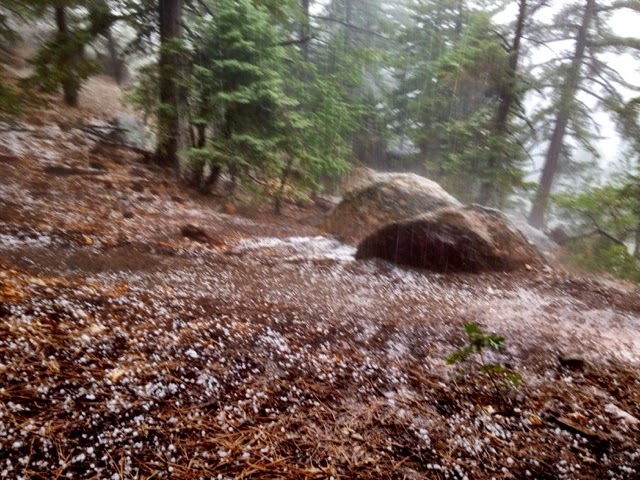 Luckily we saw two boulders kind of v’ed up against each other. 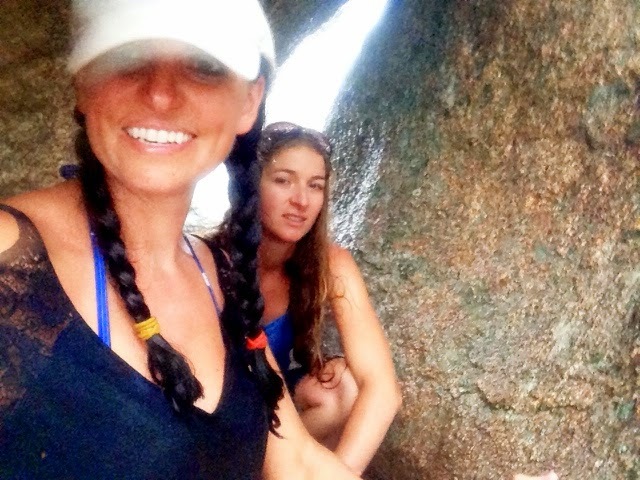 It wasn’t a big shelter but it was big enough for two scrawny trail runners to huddle under and wait out the storm.